Healthcare offers a plethora of career opportunities. A physician is placed at the top of the hierarchy but there are a number of other allied job opportunities that will help you earn top dollars. A conventional medical degree can very well take your educational debt to the stratosphere. If you are unable or uninterested in taking on such a huge financial burden, consider yourself lucky because the options available are plentiful. The field of healthcare is growing and there is a continued demand for health assistants, nurses and other professionals and allied health workers. With the baby boomers aging and Generation X moving towards parenthood, the field of healthcare will always be bustling with activity. And global economy and recession do not affect the medical field either. Another aspect of allied healthcare jobs is that most do not require extensive periods of study in school, which means that you can enter the workforce pretty quickly and start earning right away. Here are a few of the upcoming and well-paying career options in allied healthcare that you can consider if you want to be a part of this fast-growing industry. Medical perfusionist ensures your circulation and respiratory functions are normal during the course of a cardio-vascular surgery. Perfusionists operate a heart-lung machine that pumps oxygenated blood into the body while the heart is being operated upon. In this manner, the metabolic and physiological demands of the body are catered to while the surgery is on. Perfusionists are now seeing their role and demand being extended to other departments and functions also. You can choose to peruse a perfusionist training program after you complete your four-year degree. Occupational therapists see a high level of demand from people employed in diverse industries like construction, mining, oil and gas exploration, and agriculture. Work-related injuries require the services of occupational therapists who are more specialized than regular physical therapists. An occupational therapist will help people recover, recuperate and get back to work. Educational programs vary from 2-year post-degree programs to more extensive master’s and doctoral programs. Dental hygienists primarily offer preventive care to patients. As a hygienist you will examine and determine the overall oral health and hygiene of patients. You will also detect early signs of dental diseases and recommend further treatment for patients. Hygienists help patients with information and guidance towards better oral health. An associate’s degree will help you get started in this field. Employment opportunities are expected to grow at a very quick rate of about 33% through 2012 to 2022. According to the BLS, employment scope for medical assistants is expected to grow at a higher than average rate of 29% through 2012-2022. 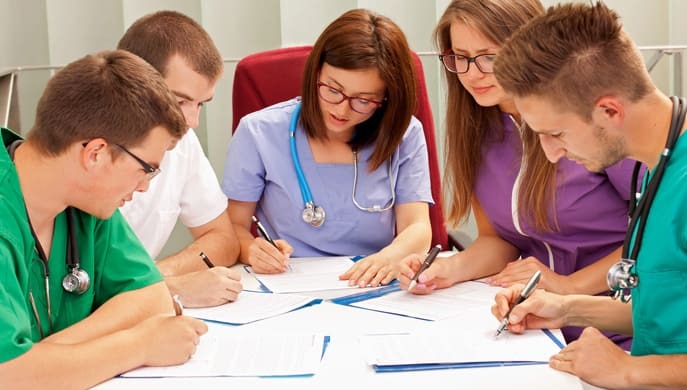 Medical assistants are expected to deal with clinical and administrative tasks in the offices of physicians, at big private practice facilities and at the various departments of hospitals. This job is especially suitable if you are looking at a short stint in school. A post-secondary certificate will be sufficient to land your first job. Employment is projected to grow 29% from 2012-2022. AIHT offers Medical Assistant & HIPAA Specialist Training in CT where you will gain theory and clinical skills in all relevant areas. The lab hours will equip you with the much needed hands-on experience. Transplant coordinators have several duties and roles and are called upon to coordinate all activities involved in the donation and transplantation of solid internal organs including heart, liver, kidney and pancreas. As a transplantation coordinator you will be involved in pre- and post-transplant care of patients as well as donors. It will be easier to start with your career as a transplant coordinator if you have prior experience as a healthcare professional. Board certification through the American Board for Transplant Certification can be acquired after gaining relevant experience. Doctor of Pharmacy is a 4-year professional degree which will get you certified to practice as a pharmacist. You must also be licensed by an approved body as per the regulations applicable in your state. Pharmacists are much in demand and can render their services in pharmacies including those in groceries, drug stores, clinics and hospitals. Pharmacists read doctor’s prescriptions and dispense medicines to patients. They advise patients on safe dosage and other conditions of use. Pharmacists are trained to read chemical composition of medicines. As a pharmacist you will be responsible for the safe and secure storage, and supply of medicines. You will also be able to read patient symptoms and provide services like monitoring blood pressure and suggesting measures for cholesterol management. Employment opportunities for trained pharmacists are expected to grow 14% from 2012 to 2022. If you are keen to pursue a career in the field of allied healthcare, do carefully consider the varied options you have. All the above given fields help you earn well. They are also very rewarding and gratifying because you are involved in service to your community and society.